With Labor Day Weekend in the rear view mirror, it’s time to set our sights on the fall bite in northern, Wisconsin. Extremely hot and dry temperatures we had in July and August are definitely affecting the fall cool down, but cool nights and shorter days are on the way. Fall is knocking on the door, and these lakes have to cool down at some point. We’re ready for it! We don’t get a lot of “Free” days, but we take advantage of everyone we get. Wednesday was spent with Terry Peterson (The Professor), trying to figure out the walleye bite in the Hayward Lakes area. It’s been a struggle for us lately, but we might have figured a few things out. The deep water bite disappeared a long time ago, and there’s a few suspended fish being caught trolling main lake basins. It’s time to check out weed lines, and I’m sorry that I didn’t think of it sooner. We connected with some good eyeballs up to 18″ on jigs and minnows using a stiff north wind to drift weed edges in 15′ -18′ of water. They had to be somewhere… It wasn’t a crazy good bite by any means, but it was enough to convince us that weeds are the key right now. Water temperatures are struggling to drop below 70 degrees even with a north wind and cold front moving through our area. It’s going to take some time to cool things down… We didn’t clobber them in any respect, but there’s hope. We’re getting close! Day #2 of our trip was spent catching some fish for a fry. We were back in the Hayward area focused on putting some crappies in the boat. Ryan and Josh were with me, and we spent some time trying to find crappies on deep mud flats in 20′ – 22′ of water. Finding fish on the electronics wasn’t an issue, but finding biters was. Skies were high, the water was flat, and the fish were stubborn. We’d catch fish every time I’d drop anchor, but it was a one or two at a time kind of deal. Plastics under slip bobbers was our most effective presentation as I tried several different approaches before settling in. Sometimes you just have to work for them, and that’s alright. A pretty good east wind kicked up around mid morning, and that seemed to trigger the bite a bit. In the afternoon, I switched colors on our plastics, and there was a definite improvement in action after that change. Who knew crappies were so picky…? It wasn’t a huge difference, but it was enough to get the fish we needed. Ryan and Josh caught a good mess up to 11″, and we had some pretty respectable numbers by the end of the day. They didn’t come easy, but nothing worthwhile ever does. Water temperatures began at 68 degrees and hit 72 by quitting time. It was a fun way to wrap up a good trip, and I’m glad we were able to work it out. Enjoy that fry fellas!!! After a couple of days off the water, it was time to get back after it… Bill Whitfield from Fayetteville, AK and his family have been fishing with us for a long time. He returned on Tuesday for his annual fall trip with his regular crew to fish with Terry Peterson and I, and it’s always great to see this gang get in the boat. We spent day #1 of a 3 day trip in the Hayward area. Bill’s daughter Cheri Holzer and her husband Mark were in my boat, and he spent the day with his wife Ruth in Terry’s boat. We spent the morning targeting smallmouth bass in shallow water and found some big ones pitching plastics in a variety of presentations into 5′ – 10′ of water along rock edges. In fact, we found some “REAL” big ones. Cheri and Mark landed some fat brown bass that included an incredible looking 21″ fish. That thing was crazy big! Big south winds kicked up in the afternoon, and the pattern we were on became impossible. We spent our afternoon using the electronics to locate schools of fish in calm areas of the lake and found just enough to keep us busy. They were stacked up on rock piles in 17′ – 20′ of water, and we used the wind to make drifts with minnows on live bait rigs. It was a good example of the importance in staying versatile. You’ve got to go with the flow, and my crew was rewarded for doing just that. We caught a bunch of big fish, and had a blast doing it. Not lost in any of this was the fact that it was the 17th anniversary of 9/11 and a pretty sobering reminder of how lucky we are to be doing what we do. We spent some time talking about and remembering where we were when it happened. Never Forget!… Water temperatures are finally starting to drop a bit, and we read 68 degrees throughout most of the day. Two more days with this awesome crew, and I’m looking forward to what’s next… Meet you at the landing tomorrow Whitfields!!! Summer like temperatures continued in northern Wisconsin on Wednesday, and the Holzers were back in my boat along with the Whitfield’s in Terry’s. We stayed in the Hayward Lakes area and targeted crappies. The deep bite has definitely set up on some of our lakes, but fish seem to be on the move daily. You never know exactly where they’ll be from one day to the next, and it usually takes a bit of searching before you can dial in on them. They definitely moved from the last time we fished them, but it didn’t take long to get on a stack of good slabs. The migration to deeper water continues with 20′ – 25′ of water being the preferred depth for the day. It looks like the thermocline is pushing deeper, so it makes sense that the fish will respond accordingly. Slip bobbers with plastics and jigging spoons continued to be the most effective approach. Mark and Cheri taught them a lesson putting big numbers of fish up to 11″ in the net. More stories, more laughs, and lots of fish catching. I know it’s supposed to be fall, but you sure wouldn’t know it right now with temperatures near 80 degrees and south winds. It will cool down soon enough, and we’ll enjoy the warm weather while we have it. Water temperatures ranged from 67 – 70 degrees. One more day with this bunch coming up. Can’t wait! After a day off the water, our crew of Razorbacks from Arkansas were ready for one more day. 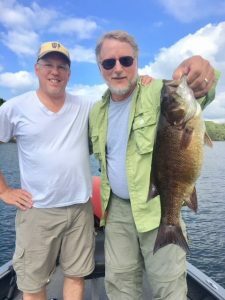 Bill Whitfield has always been a smallmouth nut, and there wasn’t any doubt that we were going to spend the last day of his trip chasing bronzebacks in the Hayward area. It certainly seemed like a good idea the way things have been going lately with bass pushing shallow and on the feed. The only problem with a good bite is that it has to end at some point… It came to a screeching halt on Thursday. There weren’t any big weather changes with warm temperatures and south winds continuing, but we found some tough sledding. Mark and Cheri were with me again, and our first approach was throwing plastics along shallow rock piles in 2′ – 5′ of water. We caught a few small fish, but nothing of any size. They must have moved deep right? Not exactly… I searched and searched in the 15′ – 25′ zone and found a few fish using live bait rigs, but not many. The Holzers put a couple more in the net, but that was it. Time to try 10′ – 15′. Same result… We caught a couple including a nice 18″ smallie, but the action fizzled out in a hurry. Pretty tough to make a pattern out of that! Time for lunch and a new lake! We took the crew to Angler’s Haven and hoped our luck would change in the afternoon. Dave Molback (Pleasant Prairie, WI) switched spots with Cheri for the PM shift, and tough conditions got tougher… What little wind we had laid flat, and things got cooking with temperatures hitting the mid 80’s. It sure felt a lot more like the middle of July than the middle of September. Water temperatures hit 75 degrees, and I had a feeling things would be slow. It was, but we were able to scratch out some fish on deep rocks in 15′ – 25′ of water as well as breaklines in 5′ – 10′. They must be all on the same page! It’s always good to end on a good note, and we did just that. Our last spot of the day produced several fish with a good flurry of action. Dave landed the largest fish of the afternoon putting a fat 18″ fish in the net, and our afternoon numbers exactly matched our morning performance. Funny how that happens on two different bodies of water… We earned every one we caught. No doubt about that! It’s always hard to say good-bye to the Whitfields, but it was time to send them on their way. Thanks for everything guys. Until next year!!! I woke up to thunderstorms on Saturday morning. Tal Janowitz from Franksville, WI must be in town! Some people just seem to be cursed with the bad weather bug, and Tal has had a couple of trips cancelled over the past few years due to bad weather. Well, he was back for his fall trip and brought along his friend Dave Misic from Lake Villa, IL. The weather man said that the rain would end by 8 am, so we were going to squeeze in a half day trip. We’ve covered just about everything with Tal, but crappies are an itch he hasn’t scratched yet. With the results we’ve had lately, I was confident we could take care of that. We hit the water when it looked like the storms had cleared the Hayward area, and I went right back to where we were catching them a few days ago. Gone! The thermocline that had been pushing deeper appeared again higher in the water column, and it was time to do some looking. That’s been a common theme lately, and I don’t ever remember using the word “thermocline” so much in my reports… After looking and looking I finally found a stack of fish in 15′ of water. Tal and Dave started pulling them in using slip bobbers and plastics until another storm rolled in, and we had to take cover. That dang weather man lied again! After the fireworks passed, we were back on the move and so were the crappies. They weren’t sitting still whatsoever, and we had to keep moving to stay on fish. I’d locate them, drop anchor, and we’d catch a few. It was a game of cat and mouse, but I’d say we won. The anchor got a work out, and our electronics were key. As soon as fish would disappear from my screen we were on the move. 15′ – 17′ was the magic depth. Tal and Dave did an excellent job taking advantage of the short windows of opportunity we had at each spot and ended up putting some respectable numbers of fish up to 11″ in the boat. By mid morning the skies cleared and the oven turned on again with temperatures climbing into the high 80’s. This is just crazy! Excellent work today boys. The only thing missing was treats from Tal’s wife Darlene. You’re slacking Tal… Can’t wait to do it again!!! I really don’t remember having as much hot weather as we’ve had over the past couple of months. It’s played a big role in our fishing, and I’m not sure that I know what “normal” is anymore… The extended forecast has a big cool down coming next week, but we’ll just keep rolling with the punches. I’m never going to complain when I can wear shorts when I’m fishing! By the way… Was there a Packer/Viking game this weekend?